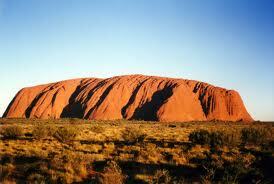 In central Australia, you’ll find a very, very large rock known as Uluru, or as the Aussies call it- Ayers Rock. The rock is made of sandstone. It changes color during the day, depending on how the sun shines on it. Sometimes it looks brown. At dawn and at dusk, it looks red. In central Australia, you’ll find a very, very large rock known as Uluru. The rock is made of sandstone. It changes color during the day. Read more all about Uluru (Ayers Rock). Uluru stands 1,141 feet tall. That’s almost as tall as the Empire State Building. It stretches over 2 miles long and 1 mile wide. Amazingly, most of the rock sits underground, although no one is sure exactly how deep it goes. At dawn and at dusk, Uluru looks red. Uluru is the Aboriginal name for this rock. 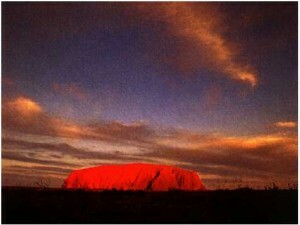 It is also called Ayers Rock, after Sir Henry Ayers. Explorer William Gosse gave it this name when he discovered it in 1873. The rock was created over 600 million years ago. The Aborigines have lived there for 10,000 years. The rock was originally at the bottom of a large ocean. Uluru is a monolith, which means one really big stone or mountain. Climbing Uluru would be hard work. Most of the sides go almost straight up. The top is flat. Uluru is covered with crevices, caves and valleys. 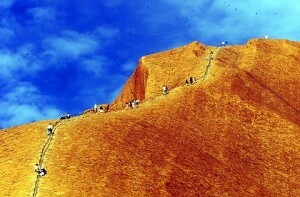 Question: Can people climb Uluru? Answer: The Aborigines consider Uluru a sacred place. People are not allowed to climb it. Question: Are there other things to do there? Answer: Uluru is part of a national park which contains other monoliths, waterfalls and wildlife. You can hike and sightsee. Enjoyed the Easy Science for Kids Website all about Uluru info? Take the FREE & fun Uluru quiz and download FREE Uluru worksheet for kids. For lengthy info click here.